After a nice meal, there’s nothing more disappointing than looking over and seeing a mountain of washing up there to be done. Thankfully, many households avoid this disappointment thanks to their trusty dishwasher, the MVP for busy families, and share houses that have that one roommate who won’t do their dishes. When it comes to finding a dishwasher to suit your household’s needs, it can be a difficult process, as plenty of brands are available with a wide variety of models, all capable of tackling the dirtiest of dishes. For many, style is as important as functionality, especially with kitchen appliances. As a result, many households and kitchens are turning to stainless steel appliances. Read on to find what brands offer stainless steel dishwashers, and which may be the best suit for your house. A big name in the kitchen appliance market, Bosch has a wide variety of dishwashing models to suit your household, with freestanding, built-in and modular dishwashers readily available through all household and electrical good retailers. Bosch’s freestanding models are available in 45cm and 60cm sizes, giving you options as to where to put the appliance in your kitchen. Regardless of size, the Bosch models come with the LoadSensor function, which adjusts the water level for optimal wash results, as well as ensures that you aren’t wasting water unnecessarily. The AquaSensor stain detection feature will also ensure that your dishes come out fresh and clean, with the ‘Intensive Zone’ able to transform the entire bottom basket into a power cleaning zone, perfect for those pots and pans. Bosch has also included a delay feature to provide households with convenience, meaning you can start the dishes even when you’re not home. The Serie 2 models are Bosch’s cheapest options, available for around $1000, with the Serie 8 costing twice as much, but come with a better efficiency rating, as well as additional features and an extra rack for those households with plenty of dishes. While it may not have the range of some other brands, Dishlex does offer consumers three freestanding models, all available with a two year warranty for peace of mind. All three models come with three-star energy efficiency ratings, along with four-and-a-half star ratings for water efficiency, helping households to save on water and electricity bills. All models also come with a variety of programs to clean all types of dishes, including rinse and hold, eco-friendly, regular and quick, allowing for easy cleaning regardless of what you load in the dishwasher. All models also come with an adjustable top basket for those tall glasses, as well as foldable cup shelves, overfill protection and bottom catchment tray features, helping to not only ensure your dishes come out shining, but to make sure there’s no draining issues. The main difference comes in the additional features, with some models coming with a half load option for when you don’t need to wash a lot of dishes, while other models come equipped with a delayed start feature, as well as an auto-off feature to help make life more convenient. 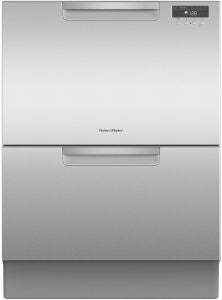 For those set on the stainless steel dishwasher look, Fisher & Paykel certainly has you covered, with all of its models available in the stainless steel finish, and with eight models to choose from, consumers are certainly spoilt for choice. The Fisher & Paykel range come equipped with a range of functions and features, including a three stage filtration system for a reliable wash performance, as well as a range of modes to suit fine glass as well as greasy pots and pans. Other features include child locks, LED displays, adjustable racks and a time delay option for comfort and convenience. 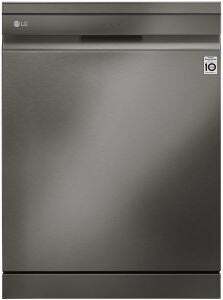 Select models also come with a Sanitise and Extra Dry washing mode for specialised washes, as well as ThermoDry technology to ensure that no water is left on your dishes after the wash. With a minimum three-and-a-half star energy rating and minimum five-star water rating across the whole range, Fisher & Paykel is certainly an option to consider. Another heavyweight of the kitchen appliance market, LG rivals its competitors with a wide variety of stainless steel dishwashers to suit all household sizes and washing loads. Included in the stainless steel line-up is LG’s latest dishwasher series, the QuadWash, which comes with a range of tempting features and functions, allowing you to stress less over doing the dishes. The QuadWash contains four blades which spin both clockwise and anti-clockwise to allow water to be delivered in multiple directions, allowing for a better clean, in addition to adjustable shelves and racks, with some models also available with a third rack. Other LG models include features such as Dual Wash Zone, which allows for a gentle wash on glasses and dishes while simultaneously power washing pots and pans on a different shelf, in addition to the TrueSteam function, which cleans dishes at 95 degrees, without the need to rinse beforehand. Most LG models will cost you over $1,000, but with all coming with at least a four-star rating for energy and water efficiency, an LG dishwasher may end up saving you money in the long run. 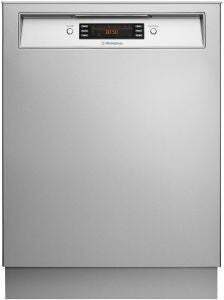 Offering a variety of cheaper options, Westinghouse has a number of freestanding dishwashers available in the flashy stainless steel finish for Aussie consumers to choose from. All scored three stars for energy efficiency, while also scoring over four stars for water efficiency. All models come with a range of features to ensure your dishes are kept squeaky clean, including up to eight wash programs such as fast wash, eco, heavy and half-load, as well as rinse aid and sensor wash to ensure you’re not wasting water. Additional features include a child lock, as well as overfill protection and anti-flood protection to ensure there aren’t any accidents while you’re away. The models themselves contain four foldable cup shelves and four foldable racks for easy storage, regardless of what you have to wash, with some models coming with the FlexRack, which is a handy cutlery tray for those larger utensils. 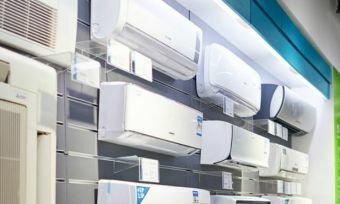 Distinguishing features between the models include the drying system, with some models featuring the active dry system, while others operate on fan drying. Other differences include a top shower, handy for a wider spread of water in the machine, as well as inclusion of a soil level sensor. With the majority of its dishwashing range available with a stainless steel finish, Euromaid will be worthwhile investigating for many households. Available in a variety of capacities and dimensions, Euromaid has an option for you, regardless of how much space you have. 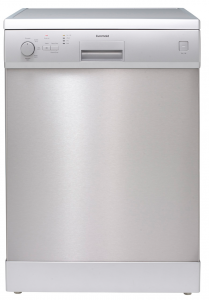 For those who don’t have a lot of space to play with, Euromaid offers a 45cm wide dishwasher, with the model coming packed with features such as child locks, height adjustable upper basket, delayed start as well as six wash programs for all types of dishes. For those with a bit more space on their hands, or those simply after a bigger model, Euromaid has multiple models to suit your needs. The DR14S and EBM14S will be able to handle plenty of dishes, handy for large households, with both models also rated five stars for water efficiency and three stars for energy efficiency. The difference between the two models however, comes from the available features, with the EBM model coming with a range of additional features and functions, including a delayed start, half load option, rinse aid indicator and active ventilation drying, making the EBM model the go-to option for those wanting the most out of their dishwasher. 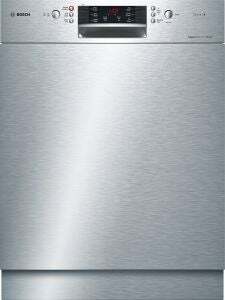 Is a stainless steel dishwasher worth the money? For some, the looks of an appliance might be the last thing to consider, but for some it’s one of the most important features, particularly if you’re fitting out a kitchen with the latest and greatest for the perfect look. Stainless steel appliances are popular for a reason, with the shiny finish fitting in nicely with many kitchens. While popular, when it comes to purchasing a dishwasher, there is a lot more to consider than the outside finish. 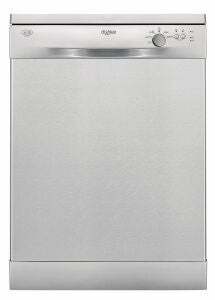 Think about the size, capacity and how much work you expect to put your dishwasher through. Other factors such as child locks, adjustable storage and washing programs are all worthy of consideration. With plenty of well-known brands offering stainless steel dishwashers, it’s best to do your research before you hand over your hard-earned money, as you never know what you might find. Take your research to the next level with our customer satisfaction ratings report via the link below.